On April 14, 2017, Foreign Minister Wang Yi held talks with Minister for Foreign Affairs and International Development Jean-Marc Ayrault of France in Beijing. 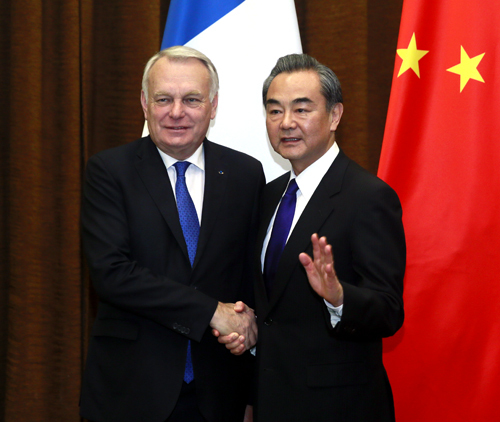 Wang Yi noted that for the past five years, under the care and promotion of the two heads of state as well as joint efforts of both sides, China-France relations have reached a new historic height, and China-France comprehensive strategic partnership has become one of the most mature and stable major-country relations on the current international stage. Both sides have enjoyed more mature and complete dialogue and coordination mechanisms, achieved breakthroughs and innovation in the contents and approaches of practical cooperation, built a more solid and stable public opinion foundation, and stepped onto a new stage of bilateral cooperation in international affairs. It is hoped that both sides could continuously respect each other's core interests and major concerns, well implement practical cooperation in such fields as nuclear power, aviation and aerospace, and cooperation in third-party markets, actively discuss to carry out cooperation in production capacity and other areas in countries along the "Belt and Road", safeguard the Paris Agreement on Climate Change, promote cooperation in green industry, and enhance people-to-people and cultural exchanges. China supports the European integration process, and stands ready to, together with the EU, deepen the establishment of the four major China-EU partnerships, safeguard global trade system, and push forward the process of multi-polarization. Jean-Marc Ayrault expressed that French-China relations maintain a sound development momentum, and bilateral cooperation in various fields achieves positive results. His visit to China before the French presidential election was to highlight the significance and soundness of France-China comprehensive strategic partnership and manifest the important role that France-China relations played in the world peace and stability. Whatever the result of the French presidential election is, France-China comprehensive strategic partnership will continuously develop, and bilateral cooperation in economy and trade will not be affected. The French side is willing to, together with China, continuously advance cooperation in nuclear power and other fields, and strengthen people-to-people and cultural exchanges in such areas as culture, tourism and sports. France will take measures to ensure the security of Chinese citizens travelling to and staying in France. The country also stands ready to support and participate in the "Belt and Road" construction. As an important member of the EU, France will continuously stick to trade liberalization and play an important role in advancing the construction of the EU integration.